Powderhorn Park	This park is home to the May Day Festival and Powderhorn Arts Festival. 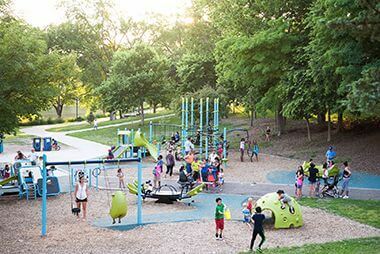 Master Plan: After two years of extensive community engagement, the Powderhorn Park Master Plan was approved in 2016 as part of the South Service Area Master Plan. 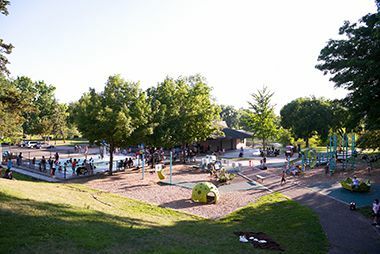 The Powderhorn Park Master Plan will guide outdoor park improvements at Powderhorn Park for the next 20-30 years. Click the link below to view the master plan. 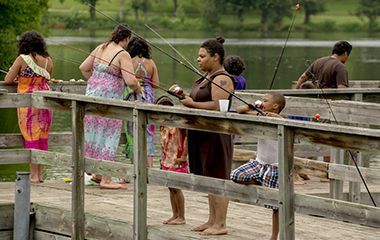 Powderhorn Park’s lake is stocked every year with crappies, sunfish and adult catfish up to 10 pounds. Name: The name was taken from the name of the lake in the park. The lake was named for its shape, which resembled an old powderhorn, a cow horn used to carry gunpowder. The name first appeared in an 1839 survey of the Fort Snelling Military Reservation. At that time the lake was larger than it is today. The lake level dropped considerably in the early 1900s, and the northern arm of the lake was filled in 1925. The name was never formally adopted, but was used from the first reference to the area in park board proceedings in 1883. Acquisition and Development Powderhorn Lake and its environs were among the first places considered for a park in Minneapolis. Only two months after the park board was created by the state legislature and approved by Minneapolis voters in April 1883, residents in the vicinity of the lake petitioned the park board to make it a park. But the park board at the time was starting from scratch and focused instead on creating parks nearer the center of the city, at Lake Harriet and along the Mississippi River. 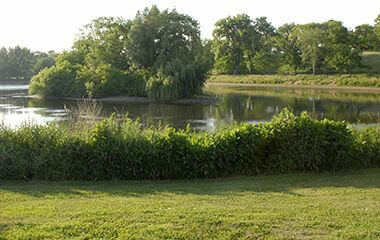 (The first parks acquired by the park board were Loring Park, Farview Park, Logan Park and Riverside Park.) Instead of a park at Powderhorn Lake, the board’s focus across south Minneapolis was on a parkway proposed by landscape architect Horace Cleveland that would have extended from the Mississippi River to Lake Calhoun along Lake Street. Park commissioners quickly realized that the property along Lake Street was already too high-priced to acquire the entire street as a parkway and in 1884 shifted their attention four blocks further south to 34th Avenue. The advantage of that street for a parkway is that it would have incorporated Powderhorn Lake into a parkway that would have met up precisely with Summit Avenue on the St. Paul side of the river. (St. Paul developed Summit Avenue, to designs by Horace Cleveland, to meet up with Cleveland’s revised plans for a parkway on 34th Avenue.) The parkway project across south Minneapolis was also abandoned in 1885 because the land even on 34th Avenue was too expensive. Property owners from the river to Bloomington Avenue had agreed to donate most of the land, but from Bloomington Avenue to Lake Calhoun the board met with little success in urging landowners to donate a right of way for a parkway. During that time the park board continued to consider a park at Powderhorn Lake and in 1884 even accepted a donation of part of the land at the lake. But by the summer of 1885 the park board voted to abandon efforts to acquire Powderhorn Lake until property owners submitted a “more reasonable proposition.” Two years later, in 1887, the park board did designate the lake shore as a park but had to abandon the effort again in the face of what it considered high prices for the land. In the 1887 annual report park board president Charles Loring wrote with more than a hint of frustration, “An attempt was made to secure Powderhorn Lake and a small tract of land upon its shores, but some of the water proved so valuable in the opinion of a few of the owners thereof, as to cause the project to be abandoned, temporarily at least.” Loring had by that time personally secured the donation of most of the shores of Lake Harriet and Lake of the Isles for the park board and was clearly disappointed by his lack of success in replicating those efforts at Powderhorn. But the park board did not give up. In May 1889 the park board designated 38 acres around the lake as a park and began condemnation proceedings to have the land appraised. By the end of the year the acquisition was still pending because so many land owners had filed objections to the value that park board appraisers had placed on the land. Loring noted in the 1889 annual report that the acquisition had failed twice before and expressed his hope that this time it would succeed. It did. In 1890 the acquisition of 38½ acres was completed at a cost of nearly $40,000. The total cost of the land was assessed on property in the area. The park board vacated the streets through the park and asked Horace Cleveland to prepare a plan for the layout of the park. Almost as soon as the first land was acquired, residents in the area petitioned the park board to add 25 acres to the park on the west and south. Late in 1890, the park board solicited offers from the owners of the land to expand the park. Loring noted wryly that some of the landowners who had objected to being assessed for the original park were among the petitioners for the expansion of the park. Loring wrote that with the expansion the south-central portion of the city would have “a magnificent park.” Powderhorn Park was expanded in 1891 by nearly 20 acres, with only several individual lots still to be acquired to complete the park. Powderhorn Park was one of three large additions to the park system from 1889 to 1892 and all were created around small bodies of water. Glenwood (Wirth) Park around Birch Pond was acquired in 1889 and Columbia Park around Sandy Lake was acquired in 1892. (Sandy Lake ceased to exist in 1915 when the city installed storm sewers in northeast Minneapolis that drained storm water from the region into the Mississippi River.) A smaller acquisition, the ten acres that included Spring Lake, now a part of The Parade, was also completed in 1889. With these acquisitions the park board continued its unstated policy of gaining control of the lakes and ponds within the city. In the first ten years of its existence the park board had acquired more than half the bodies of water in the city: Loring Pond, Lake Harriet, Lake of the Isles, part of Lake Calhoun, Powderhorn Lake, Sandy Lake, Birch Pond and Spring Lake. Still remaining to be acquired were the remainder of Lake Calhoun, Keegan’s (Wirth) Lake, Cedar Lake, and the two swampy bodies of water southeast of the city, Lake Amelia (Nokomis) and Rice (Hiawatha) Lake. Most of those lakes were acquired in the first decade of the 20th Century. They may have been acquired sooner if not for the Panic of 1893, which led to a local and national economic depression. From 1893 to 1902 the park board acquired almost no land, and struggled to maintain the land it already owned. 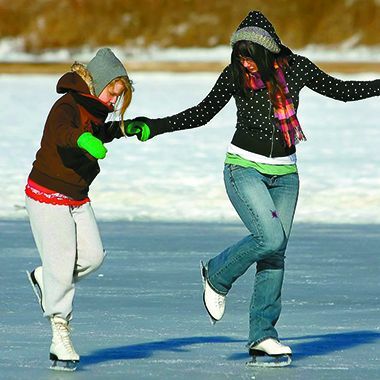 Shortly after the first acquisition at Powderhorn Lake, the park board established a skating rink on the lake in 1891, one of only five rinks maintained by the board. It was the beginning of one of the park board’s most successful recreational facilities. In 1892 Horace Cleveland and his son Ralph, who had left his job as the manager of Lakewood Cemetery to assist his aging father, submitted their plan for Powderhorn Park, which was included in the park board’s 1892 annual report. The most striking feature of their plan is that the lake at that time extended north to 32nd Street. The northern arm of the lake no longer exists; nearly one block of the lake was filled in the mid-1920s after years of low water levels in the lake. Cleveland’s plan for the park included the creation of an island near the southern shore and a bridge over the narrow neck of the lake at 33rd Street. 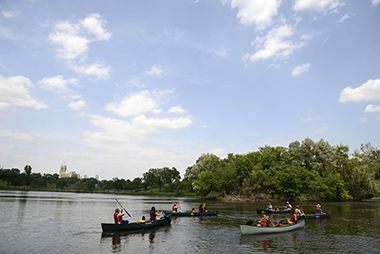 The plan called for dredging the lake to improve the shoreline as had already been done at Loring Pond and the northern shore of Lake of the Isles. Upon completion of the first round of dredging at Lake of the Isles in 1894, the dredge was moved to Powderhorn Lake to begin work there. In 1895 dredging of the lake deepened the water and reduced its size by nearly eight acres, including the creation of an island of more than half an acre. However with the economic depression and an extreme shortage of funds for the park board, the rusting dredge still sat in the lake in 1903, when the park board finally resumed its plans to improve the lake. In the meantime, as the local economy began to improve, the park board purchased a half-block in the northwest corner of the park in 1899 at a cost of $1,800 according to the 1899 annual report. The reason for the addition to the park is particularly interesting in light of concerns with water quality in city lakes that began nearly 100 years later; the park board reported that it had acquired the additional land because it “rendered it possible to control the wash on streets into the lake.” It is one of the first mentions in park board documents of concern over storm water runoff into lakes. The western section of the park was initially graded and walks were laid out in 1899. More than 100 trees and 1600 shrubs were also planted in the park that year. The planting plan was created by noted landscape architect Warren Manning (Horace Cleveland had retired). Manning recommended at the time that the park board construct a shelter for skaters at the lake. The first shelter was built in 1900 and enlarged in 1902. With economic recovery, the park board dusted off Horace Cleveland’s 11-year-old plan for the park in 1903 and approved its implementation. However the full development of the park awaited the arrival of a new superintendent of parks, Theodore Wirth, in 1906. After nearly a year on the job, Wirth recommended in the 1906 annual report that the shores of the lake be widened to create a walkway and that some of the open spaces be converted into a playground. Following the establishment of the park board’s first playgrounds at Logan and Riverside parks early in 1906, Wirth recommended the creation of playgrounds at five more parks. Powderhorn Park was on his list. The first playground with gymnastic apparatus was established at Powderhorn Park in 1907 along 10th Street between 32nd and 33rd. A toilet building was installed as well. The first supervisor of recreation in the park system, Clifford Booth, reported that the best-organized classes for instruction on the gymnastic apparatus installed in the parks that year were at Farview Park in the afternoons and Powderhorn Park in the evenings. In the 1907 annual report Wirth provided a new detailed plan for the development of Powderhorn Park, which included a feature Cleveland had recommended years before, a bridge over the narrow neck of the lake at about 33rd Street. Wirth’s plan also included a much wider lake north of the bridge. Wirth recommended building a recreation building at the southeast corner of the lake, complete with a boat landing in front of it. The board approved the construction of the shelter in 1907 and it was completed in 1908 to designs by architect L. A. Lamoreaux at a cost of about $13,000. (Oddly the building did not include toilets, as it was apparently too far from the nearest city sewer line. A toilet addition to the recreation building was built in 1914.) Basketball hoops were also installed for the first time at Powderhorn that summer and Clifford Booth reported that Powderhorn had the highest attendance of any park playground. 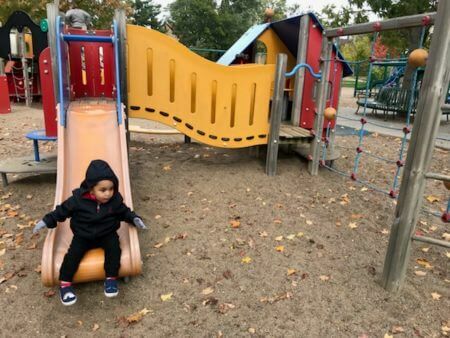 Heavy use of the playground on 10th Avenue generated complaints from neighbors about the noise, however, prompting Wirth to recommend that the playground be moved to the southeast corner of the park next to the new shelter. The playground was finally moved to the new location in 1911 and Booth called it a “model neighborhood playground.” Booth also noted that two coasting courses for sledding had been established in the park. The first three tennis courts in the park were also built that year near 10th Avenue and 34th Street. From 1907 to 1914, the park was expanded by about 6.5 acres through several transactions to its present boundaries on 35th Street. Land was also purchased along 10th Avenue at 32nd Street to complete that corner of the park. Wirth noted in his 1911 report that the lake level had dropped two feet for unknown reasons. Perhaps it was the drop in the lake level that prompted Wirth to propose that the northern arm of the lake be filled. In the 1914 annual report Wirth wrote that he was “still of the opinion” that the lake should be reduced in size. He repeated the call to fill the lake in 1915, suggesting that the created land would be suitable for an amphitheater or athletic field with a grandstand. He included in that report a new design for the park. Wirth repeated his call for a reshaping of the lake over the next few years without success, although he wrote that residents of the area had requested that his plan be implemented and had agreed to pay the cost through assessments on their property. To buttress his argument, Wirth wrote in 1921 that the level of the lake had dropped six feet in fifteen years. Wirth finally got the go-ahead from the park board to reduce the size of the lake late in 1922, but his plan for a new athletic field and grandstand at the park was not approved. Dredging of the lake to generate the fill for the northern arm was begun in 1924 and completed in 1925. During the reshaping of the park eleven new tennis courts were added as well. The smaller lake became home to an important attraction in winter, a speed skating track that hosted national skating championships and Olympic speed-skating trials in the 1930s. Attendance at the 1934 national speed skating championship was estimated conservatively at 50,000 for the two-day competition. Attendance at the Olympic trials the following year was reportedly hurt by sub-zero weather. The Olympic trials were held again at the track in 1947 and four of the nine skaters to win spots on the U.S. Olympic team were from Powderhorn Park. One of those four, Ken Bartholomew, won a silver medal at the 1948 Winter Olympics in St Moritz. The other Minneapolis skaters on the U.S. Olympic team were Arthur Seaman, Robert Fitzgerald and John Werket. The speed skating track was moved to Lake Harriet in the early 1960s and later shifted to Lake Nokomis, but the popularity of speed skating waned in part due to a change in speed skating competition from pack skating to racing against the clock, the European style, on a larger track. The speed skating track was reopened at Powderhorn in 1990, but was shifted to Armatage Park in 1999 as an experiment. It has since been discontinued. Few changes were made to Powderhorn Park or any other park during the Great Depression and World War II. Some work was done in the park, including construction of a shore protection wall around part of the lake, in 1940 under a federal work relief program. 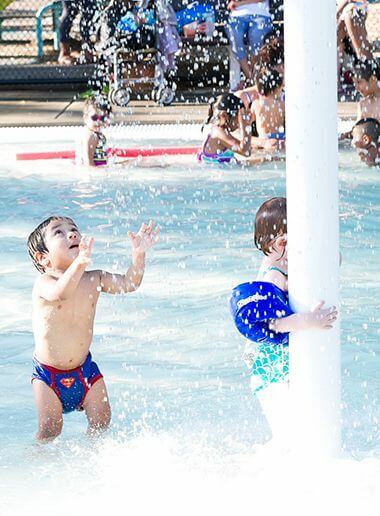 The first significant changes to the park waited until 1963 when the recreation building was renovated and became the first recreation center to have air-conditioning. That year the hockey rink was moved from the lake, but general skating was still done on the lake. The 1963 annual report of the park board noted that the lake had dropped another 3.5 feet to its lowest level in recorded history. City water was pumped into the lake to raise it ten feet. The low water level was thought to be temporary, perhaps caused by the digging of the trench for I-35W to the west of the park. 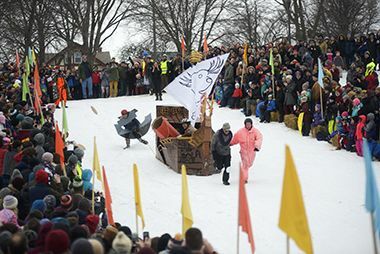 In 1966 the park board resurrected an idea from the distant past when it staged a new park pageant, “Song of Hiawatha,” featuring children from parks across the city. Children’s pageants had been popular late-summer entertainments at Lyndale Park in the 1920s and 1930s. A new totlot for smaller children was installed in the park at 14th Avenue and 35th Street in 1968. The totlot was a prototype for nine others installed around the city later that year. The old twice-renovated shelter beside the lake was replaced with a modern recreation center with a gym in 1971-72. That facility was remodeled in 1996-97. At that time a pump system was installed in another attempt to control the level of water in the lake. A new fishing dock was also installed in the lake. Another innovation at Powderhorn Park was introduced in 1995 when “Powderhorn Prairie” was created by seeding the east and north hillsides of the park with native grasses. Powderhorn Park was one of the first five parks to have a computer lab installed in 2001. 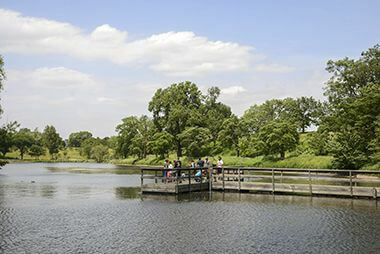 As part of the effort to improve water quality in city lakes Powderhorn Lake was treated with alum in 2003, which resulted in the best trophic state index recorded at the lake since water quality monitoring began at the lake in 1992. The outdoor basketball court was replaced in 2007, the same year that the park hosted Arbor Day festivities and the planting of 200 trees. The park board began hosting the annual National Get Outdoors Day at the park in 2011. 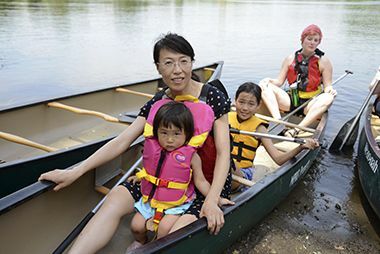 The day is designed to give people a chance to try new outdoor activities like canoeing, standup paddle boarding, geocaching, fishing, birding, rock climbing, mountain biking and archery. Construction of a new concrete path and lighting around Powderhorn Lake, and sidewalk along Powderhorn Terrace, was substantially completed in 2013 following rewiring of lights on the athletic fields north of Powderhorn Lake. Trivia In 1892 Powderhorn Park provided a test case for the park board’s authority to vacate city streets through parks. 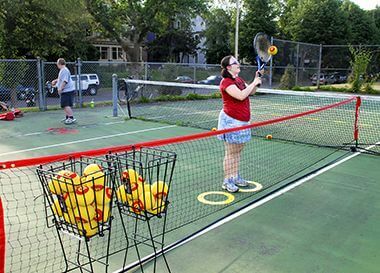 The Minnesota Supreme Court ruled that the park board did have control over city streets running through parks, but not streets adjacent to parks. The ruling confirmed that the park board had sole authority to close streets through land it owned. In 1911 the park board placed a limit on the number of minnows that anyone could take from Powderhorn Lake: 100 per day for personal use, but they could not be sold. History through 2008 written by David C. Smith, with updates from 2009 to present written by MPRB. 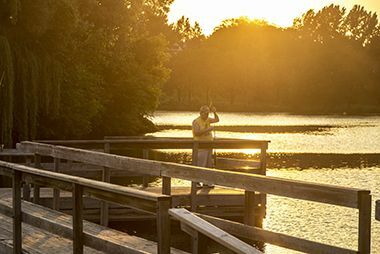 Powderhorn Park's lake is stocked every year with crappies, sunfish and adult catfish up to 10 pounds. Learn about Minneapolis lakes, the wildlife they support and the importance of water quality at canoe lessons..
Just because the lake is frozen doesn't mean that sailing has to stop! The lake was named for its shape, which resembled an old powderhorn, a cow horn used to carry gunpowder. 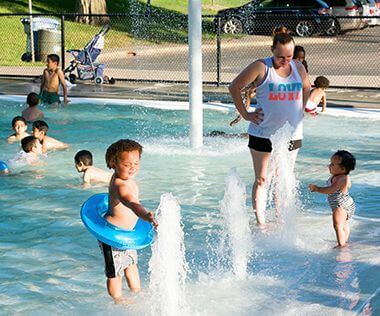 Cool off in the summer at the Powderhorn Wading Pool. 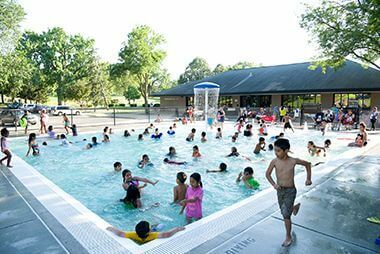 See our other wading pool locations..
Powderhorn Park offers outdoor programming year-round with ice skating in the winter. 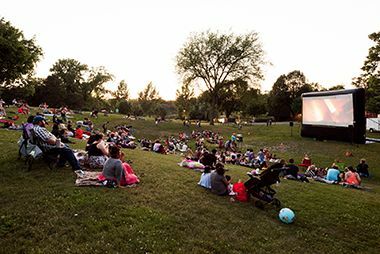 Every summer you can enjoy a series of free music and movies in the park at Powderhorn Park and other locations throughout the park system.